Nisim NewHair Biofactors shampoo is effective for both men and women. It's backed with a 100% Money Back Guarantee -- if you do not receive the desired results within 7 days of continuous use, simply call in for a full refund. There is no time limit to request a refund → click here to view full details. It is more common for women to have normal to dry hair. The shampoo has been developed and tested to work in harmony with the Nisim NewHair Biofactors Hair and Scalp Gel Extract. Use this shampoo as your first step in the advanced NewHair Biofactors system, available for both normal to oily hair and normal to dry hair. 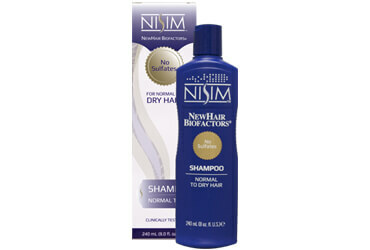 Nisim Shampoos can be used as a stand alone product. Proper use of shampoo alone can help you maintain your existing hair. It is very important that you wash your hair daily, and that you wash rinse and repeat. The shampoo itself is good and works well for washing your hair. However I find it very strange that a shampoo marketed as something to use when fighting hair loss contains silicones. More specifically: Dimethicone. This silicone is by many experts and studies shown to clog your hair follicles and prevent new hair to grow. Not only are you washing your hair one time but twice. This will leave a thin film of silicone on your scalp and then you are supposed to use the hair extract after you have given your scalp a nice barrier of silicone. The logic here seems strange. Bottom line: if you want a good shampoo without sulfates then this is a really good option. However if you are trying different steps to prevent hair loss then stay away. Far, far away from this shampoo. My daughter is always loosing her hair because the cheap off brands over dry her hair and her hair falls out. I was looking for a better shampoo and a close friend bought this product for her. With this shampoo, the hair loss was cut back drastically. I am so impressed with the fact that her hair isn't falling out all over the place and the shine to her hair is beautiful. I recommend this to anyone. I absolutely love this shampoo. It's amazing. No sulfates! Yay! My hair loss has basically stopped since I started using this shampoo and now my hair feels so much fuller and softer. I'm very pleased that I purchased this and my results are really everything and more than I had hoped for; I would highly recommend this shampoo to everyone who needs to stop hair loss like I did. Definitely Five Stars! I have used Nisim shampoo and conditioner for normal to dry hair for over 15 years, however i find that the new sulphate free products are very drying and my hair lacks body. Is the original shampoo with sulphates still available? ?